For people who have never worked in shipping, the concept and the logistics of buying a vessel sounds mind-boggling. How one buys a piece of property in some foreign jurisdiction that likely flies another jurisdiction’s flag and possibly could fly another flag once the sale is concluded, when the holding companies of the buyers and sellers may reside in yet other jurisdictions, the vessel likely is mortgaged by a creditor in a different jurisdiction and the mortgage has to be released so that a free title can be passed to the buyers? How one can ensure that all details are attended to and the sale is smooth, and that the whole transaction does not end up in smoke once the buyers’ funds have reached the sellers’ account (buyers’ funds along with release of escrow deposit and other funds due have to reach sellers’ account before the sellers’ release the title.) Buying real estate or a car may be a mini-version of a shipping transaction and things can go wrong, but at least with real estate, it’s absolutely clear that the property is stationary and in the event of dispute, the jurisdiction is abundantly clear. For the purposes of this discussion, in our series of discussions on sale & purchase, we assume that this transaction is about the sale and purchase of a vessel in the secondary market, meaning that the vessel is already on the water and trading and the buyer intends to buy her as a trading vessel and immediately put her to work to transport cargo for profit. Transactions for newbuilding contracts to shipbuilders or ‘resales’ (usually novation agreements for the sale of newbuilding contracts to a new buyer while vessel still on contract to be built or under construction) and transactions for the sale of vessels for scrapping (demolition sale) whether directly to the end buyer (a scrap yard) or to an intermediary ‘cash buyer’ are not considered under this scenario; such transactions are still handled by shipbrokers, but there are nuances in such transactions and their contracts that for now fall outside the scope of this essay. Also, for the purposes of this discussion, we will not endeavor to analyze the logic of the seller and the buyer behind the transaction, only that these two parties, acting on their own will, without compulsion and in full knowledge of facts and market conditions, are willing and able to enter into such a transaction. A typical S&P transaction starts when an operating shipowner (someone who operates / manages their own vessels (as compared to a financial shipowner)) contacts their shipbroker (or ‘S&P broker’) to inquire about a certain type of vessel, market conditions in terms of freight, market and employment prospects, recent transactions and prices, the parties involved in those transactions and the nature of the transactions (such as ‘charter free’ sale, or with ‘charter back’ or with ‘survey due’, with ‘prompt delivery’ or ‘subject to tender’, or ‘subject to financing’, etc.) Likewise, for a potential seller, a similar phone call will be placed with the shipbroker of their choice inquiring about similar information. Once our friendly owner decides to make a purchase, they will inquire about available tonnage for sale, that is for vessels whose owners have openly been advertising them for sale through the S&P broker market, or sometimes through trade publications, internet, etc. For such available tonnage for sale, usually there is no exclusive broker handling a vessel and their owner is dependent on competitive brokers to find buyers. In certain cases for openly availably tonnage, the seller may have engaged exclusively a third-party, competitive broker to source buyers, but usually the exclusive broker may be ‘in-house’ broker or works for a brokerage office affiliated with the sellers’ group of companies. The buyers’ broker will also send a blast email (a ‘P/E’ or ‘purchase inquiry’ in brokerage parlance) to corresponding brokers worldwide looking for additional similar tonnage for sale, fitting the buyers’ guidelines of potential candidates in terms of size, age, builder, specification, etc. At the age of the internet of instant and extremely cheap telecommunications and under the mode of ‘information wants to be free’, most sales candidates are already well known to players with decent market access and set of skills. Therefore, the main purpose of any purchase inquiry is to find vessels that are not actively in the market for sale, vessels that their owners may need some convincing to consider selling them, vessels that there are certain ‘buttons’ behind their ownership that if pressed could entice their own to sell them. ‘Off market candidates’ are usually the holy grail of shipbrokerage, as these are the vessels that can be sold under certain circumstances but the market doesn’t know yet. Once a certain sales candidate has been located and there is a general understanding overall ‘price ideas’ between buyer and seller, then the buyer, through the designated ‘broker channel’ would inquiry certain technical information about the vessel for their evaluation, such ‘class printouts’ (copies of the vessel’s maintenance and condition records with their classification society), permission to ‘sight class records’, ‘TC description’ (short for timecharter description, a two-page description of the vessel that usually the owners present to charterers with the vessels pertinent descriptive and commercial information such as cargo capacity, fuel consumption, etc), ‘GA Plans’ (short of General Arrangement plans, a overall arrangement of the vessel), ‘Capacity Plans’ (showing cargo holds or cargo tanks, their arrangement including loading / discharging mechanisms, and mostly their capacity), ‘Mid-section Plan’ (showing a mid-section, vertical cutoff for the vessel), the ‘Q88’ (for tankers, short of Questionnaire 88) and OCIMF report (for tankers, short for Oil Companies International Marine Forum). Once the information provided is met with buyers’ approval, then buyers will ask for ‘permission to inspect’, that is, they will engage an inspector to visit and inspect the vessel. Usually, there is an LOI involved (‘Letter of Indemnity’ that the inspector / inspecting party indemnifies and holds harmless the owners for any damage or accidents), and the inspector in the course of several hours will undertake a superficial, pre-purchase inspection of the vessel, meaning that without interfering with vessel operations and without having the right to open up the engine or any other parts of the vessel for inspection, the inspector is allowed to sight, inspect, copy and take pictures of the vessel certificates onboard, engine room, hotel accommodations (‘superstructure’), cargo holds / tanks, hull, ballast tanks, etc, observe cargo operations and take notes. Inspecting a huge structure like a ship, while she usually undertakes cargo operations (loading / discharging) under tight time constraints, sometimes without natural light and often in dangerous or heavily contained spaces, it’s an art and a skill that often goes under-appreciated; not to mention the stakes that are tied to an inspector’s report. About a week after the inspection, once the inspector had the opportunity to return to their office and put all the information they collected into a multi-page inspection report, the buyer now has a fairly accurate knowledge of the condition of the vessel, upon which they will base their exact opening ‘firm offer’ to the sellers. 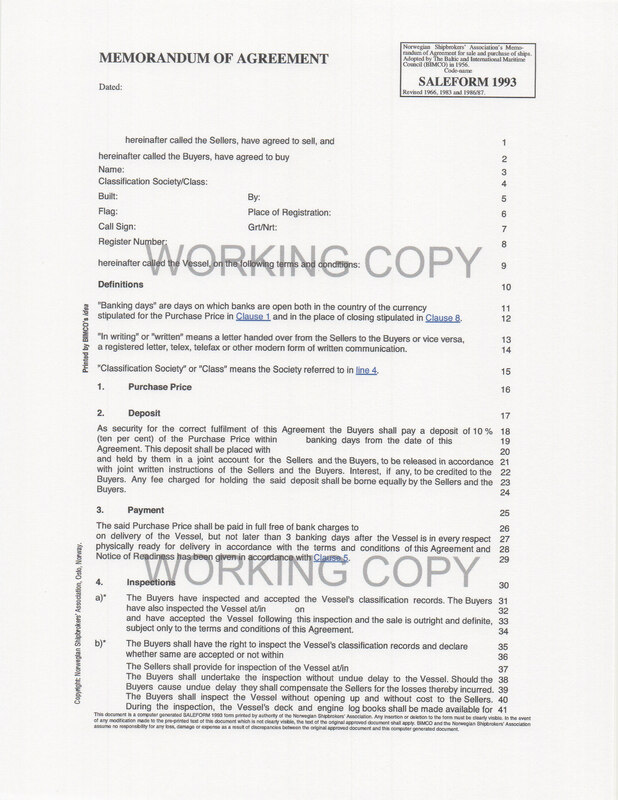 The opening offer, contains not only a pecuniary offer for the vessel, but also the ‘main terms and conditions’ for the sale, such as contemplated time and place of delivery, items to be included in the sale, expected protocol, etc, to which the sellers will provide a counter offer about the price and the terms, and items that have to be excluded from the sale (usually rented items such as nitrogen bottles onboard are not the sellers’ property so they have to be excluded from the sale, but the buyer may opt to take over the rental contract to keep them onboard). After a few turns of offering and counteroffering (fascinating ‘horse trading’ ritual this has been called from parties typically associated with shipping), there is hopefully an agreement on all terms, and then there is a ‘main recap’ where a clean email copy of the main terms of proposed sale is prepared and agreement is confirmed once again by both buyer and seller, as this agreement now has the full force of a legal contract. Once the MOA is prepared by the buyer’s broker, and reviewed once again thoroughly for any errors or omissions against the ‘recap’ and its main terms, then the buyers’ authorized representative first signs an original, to be exchanged by email or facsimile, and countersigned by the sellers’ authorized representative. Once the MOA has been signed by both parties, still there is lots of work to be done until the delivery of the vessel. However, the most difficult parts of the ‘deal’ are already done with, and now it’s time for buyers to ‘lodge deposit’ usually within three banking days for the sale and look forward to the day of the closing. We are ROYAL MARINE AGENCY, professional Tank Cleaning Company and Marine Services Provider in Chittagong, Bangladesh. Royal Marine Designed for Vessel Tank Cleaning with equipment, Skilled Labors and Professional Team. Since last 10 years we are in having such Operations, performed Tank Cleaning for hot work premises of various types of Tanker vessels. We are professional and exclusive, here, we have no competitor in experience, knowledge in Tank Cleaning Hazard. We have been performing tank cleaning of almost coming scrap Tanker Vessel for Hot work, scraping at Chittagong. Bangladesh, Pakistan and India is strictly following Ship Recycling rules, no Tanker Ship allowed for Recycling with out Gas Free Hazard. Hence, Most Cash buyers are interested to done gas free /tank cleaning operations at Chittagong. We offer our business cooperation to your company if you interested in this regard, pls feel free to contact us for any information.